Not being able to go to college was a bitter disappointment to Tom Barrett -- so much so that he defaced the one award he'd earned in his young life, a medal for "Christian Doctrine." He was determined to be a success. His ambition was translated into business. 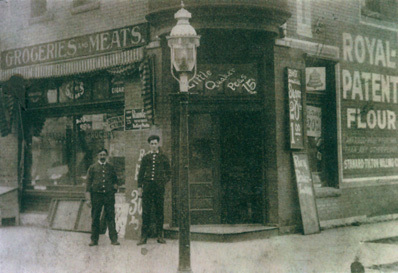 Tom opened his first grocery store at 4841 Easton Ave, at the corner of Bayard (photo above). He was operating it in 1910, with his mother and siblings living upstairs with him. He was 28 years old. He rushed his marriage with Kitty so that he could expand the business in time to compete with a new Kroger store that was opening in the vicinity. Tom bought a house on Lexington for his family, where he and Kitty lived briefly after their marriage. Then he and Kitty moved back above the store. The local Kroger competition didn't last and the hardworking couple were rewarded with their first daughter, Mary Margaret. The twins, Bill and Bob, were born at the Cote Brilliante location in 1919. In his spare time, he invented and patented a board game called "Skirmish." Tom's interest in community organizations and politics is unknown. But	he wore a gold Knights of Columbus  ring (inscribed TPB, 1907), which had to be cut from his finger when he died. His membership got him life insurance. We also know that in 1921 he was a member of the American Association for the Recognition of the Irish Republic , founded by de facto Irish president Eamon De Valera in 1920 to education Americans about the emerging Irish Republic. Tom's reputation survives as disciplined man. It's hard not to contrast his drive with the dissolution of his in-laws. It was during the time of Kitty's marriage to Tom (1912-1926) that her family officially fell apart. Five of her six motherless siblings died tragically young and the sixth was moved permanently from a girl's workhouse to an institution for the mentally disabled. And her father died from a terrible brain syndrome. The question has been raised why Kitty didn't take in her luckless siblings. 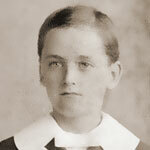 In 1912, Moses was just 16. Ethel (14) and Loretta (13) were living at an "industrial school" -- essentially an orphanage. It was a dilemma that must face every child of poverty who finds herself making good. How much do I take on all my family's burdens? How important is it for me to escape the undertow and make my own life? This is why I think of Tom Barrett as the "modern American." Having given up his own ambitions to support his mother and sisters as a boy, he was determined to have his own life, his own little children to love. He pulled Kitty along and taught her how to be a tough business woman. When he died suddenly in 1926, she was fully capable of carrying on. 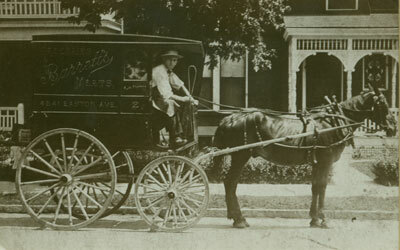 Photo above: Barrett's delivery wagon. He scratched it through, but didn't throw it away. When he got married to Kitty, she had it refinished for him. The gesture thrilled him, since he was very proud of it and it was Kitty, not his own family who saw the value in it. Skirmish. 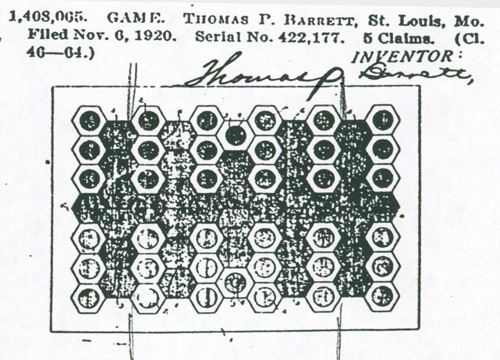 U.S. patent #1,408,065 (filed 6 Nov 1920; granted 28 Feb 1922) is a board game similar to checkers. Well, I got out the old 1940 City Directory. He evidently moved from the 4841 Easton & Bayard address and bought the stores at 4865 and 4867 Easton. I recognized the name of the liquor store at 4865 Easton: LePage Edw. Liquor and Tohtz Butcher Supply at 4867 Easton. These stores were across the street from the home of Gene and Ann McKenna where we visited often. Ann's mother lived with them and her name was Fahey who was some relative of my father. Too bad we didn't ask more questions then... 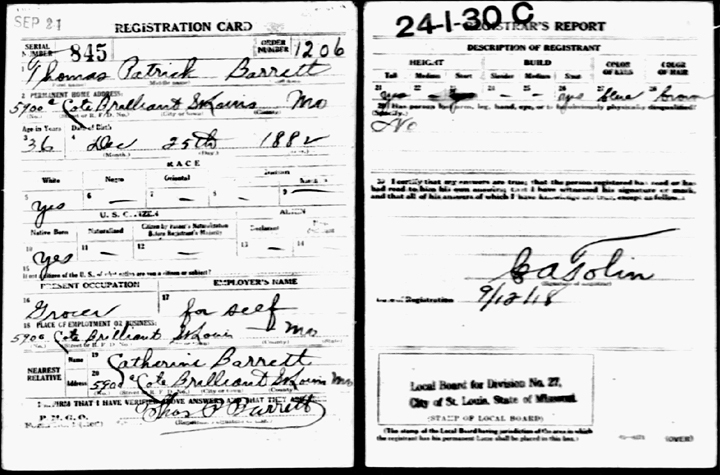 While looking up the Barretts, I found that Uncle Francis had a confectionery at 5310 St. Louis Ave and lived at 2519 Semple Avenue. From the inscription on a group photo taken at an AARIR event in St Louis. Knights of Columbus was founded in 1882 as a mutual benefit society (esp. life insurance and health insurance) for Catholics, who were barred from other organizations (e.g., Freemasons). It was also founded in order to show that American-Catholics were patriotic and loyal citizens of the United States. The first council in Missouri was the St Louis Council #453, est. 8 Aug 1899.